The property market is primed to spring into action, although the General Election could cause a bit of a blip with buyers choosing to delay their purchase plans until after May. “Octagon, like every other business, will be monitoring the ‘Election Effect’ as we get into early Spring. No doubt there will be some hesitation in the market as we get closer to polling day. However we suspect, long term, it will have little effect on the general property market, and we will carry on doing what we do best, producing high quality houses in prime locations” says David Smith, group head of marketing. 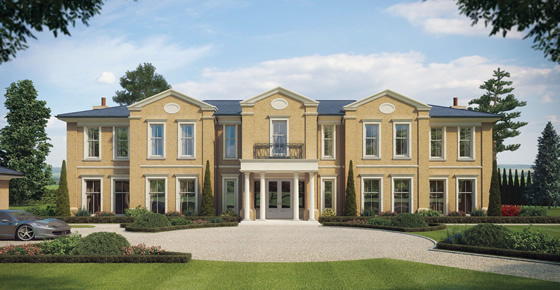 The developer is returning to some of its favourite locations this year, with some generously sized family homes emerging in Wimbledon Village, Highgate Village and Sunningdale in Berkshire. “We are also extending the boundaries a bit to accommodate growing families who have outgrown their London home. Many have decided to move a little further away from the capital, realising they can get more house and garden space for their money. Our super-sized country house underway in Picketts Hill, Hampshire and later in the year Essenden, Hertfordshire, could be the answer to their prayers, both surrounded by pleasant countryside, but close to first class schools, and within a reasonable commute of the capital” he says. Burford Place in Picketts Hill is a seven bedroom, five reception room country house with 5.5 acres – ample room for a pony paddock, stables and barn. Anyone buying early will have the chance to select their own choice of specification and finish. The house is for sale for £4.75 million. 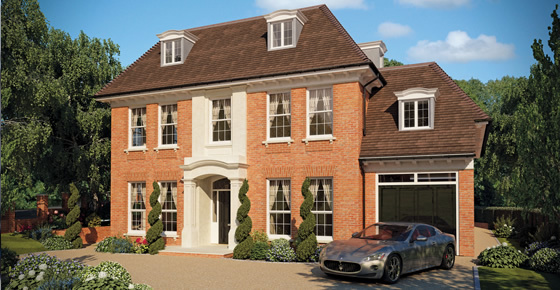 In Wimbledon Village, Octagon is building a classic detached property on a quarter acre plot in Deepdale – a quiet road, close to the high street. The three storey house, which will have very high specifications, will have six bedrooms, five reception rooms, integral garage, large games room and landscaped gardens. Price guide £6.95 million. “Since opening our office in early November 2014, we have really hit the ground running” says Michael Randall, head of Savills’ East Sheen office. “Since Christmas, the pace has remained consistent in terms of viewing levels. January was the busiest I have ever experienced, having personally worked in East Sheen for 17 years. Many buyers are seizing opportunities to take advantage of excellent mortgage rates and a number of properties on the market to choose from”. Randall is marketing a lovely house on Fife Road with the most stunning half-acre garden backing onto Richmond Park. “It’s really quite special. With properties like this one, the year ahead promises to be really rather exciting” he says. The unusually designed four bedroom house has a floor to ceiling glass wall in the living room overlooking a very pretty and lush garden with woodland behind. Features include a curved limestone staircase, double height dining room and one bedroom annexe. The house is for sale for £5.5 million. In St. John’s Road, very close to Richmond town centre, a new ‘smart home’ is for sale. Designed by Quad Architects, the 2,430 square feet house can be controlled at the touch of a button from wherever you are. It has a Victorian inspired façade, but internally the developer has made the most of cutting edge technologies, creating an ultra-light, spacious home. The five bedroom house has an intelligent, remote controlled lighting, heating, audio and security system by Loxone with concealed mood lighting in the basement home cinema, underfloor heating and SONOS multi-room hidden speakers. There are also photovoltaic cells on the roof. Featherstone Leigh is selling the house for £2.695 million. Also in south west London, Henley Homes is marketing Carlton Gate, a development on Putney Hill with an art deco style façade. Here, there will be 24 two bedroom apartments and three three-bedroom penthouses with open plan kitchen/living/dining space, terrace or balcony and high tech options of audio visual packages, mood lighting and automated blinds. The penthouses have large roof terraces. Lauristons is selling the apartments from £875,000 and the penthouses from £1.42 million. And in Wimbledon, Berkeley Homes West is marketing Dukes Gardens Apartments on Copse Hill, which runs along Wimbledon Hill Park. The development, on land which used to be hunting grounds for the Duke of Wellington, consists of 30 two and three bedroom apartments with balconies and floor to ceiling windows. Facilities include underground parking, a fully equipped gym, concierge service and landscaped gardens. Prices range from £1.15 million to £2.8 million. John D. Wood is selling Bluebell Cottage, a modern family house on the St. George’s Hill estate in Weybridge. This has four bedrooms, four bathrooms, underfloor heating, intelligent lighting and over a third of an acre garden. “The property offers very good value based on its location and glorious setting. Seldom do properties at this level and age become available on the prestigious private gated St. George’s Hill estate” says Vincent Dennington from the agent’s Weybridge office. It is on the market for £2.25 million. Knight Frank’s Guildford office is selling Silver Ley in West Clandon for £1.6 million. This house, which was built in 1937 but in Tudor style, is set in stunning gardens and grounds of 7.5 acres. There are four bedrooms and the three reception rooms and hall all have exposed beams. In the grounds, there is a stable block and paddocks. The same agent’s Cobham office is marketing Farm Cottage in Oxshott. This charming period house has five bedrooms, three reception rooms, garden with paved terrace and a detached single garage. It is on the market for £1.65 million. White Friars in Ascot is a fabulous Arts & Crafts house with eight bedrooms, four en-suite bathrooms, games rooms, cinema, swimming pool and gym. The three-storey house has been significantly refurbished with a large Mark Wilkinson kitchen leading to a conservatory, reclaimed Victorian radiators, a bespoke outside kitchen area, games room, swimming pool and gym. There is also a cinema with electric blinds. In the 0.7 acre gardens, there is a workshop, car port and double garage and the property is for sale for £3.5 million through Barton Wyatt. The final word on the market must come from one of the agent’s partners, James Wyatt. He says “the Philae comet lander should be the UK property market’s crystal ball for 2015! The news that the spacecraft, which is the size of a washing machine, had landed on Comet 67P ten years after leaving earth, was truly stratospheric. We then discovered that it bounced around a few times before settling on the comet and ended up in a rather awkward position with a very uncertain future. There is some hope that with the Rosetta spacecraft keeping a watchful eye over Philae as it circles overhead there may be good news to come. And when a ray of sunlight falls on the lander the future will start to look brighter. “The UK property market had a rather similar experience last year with a few tremulous bounces along the way, a rather uncertain landing in many parts of the country, an uncomfortable, nervous government and then, with their ever watchful eye, the Bank of England observing the situation from above. “On the approaching horizon, we have a general election and this will be key to the property market in 2015. A straightforward Conservative government will lead to a house buying boom, a Conservative/Lib Dem coalition would lead to more of the same as we have now, whereas a dominant Labour government or a Labour/Lib Dem coalition would lead to rapidly declining house prices throughout the country and economic gloom.